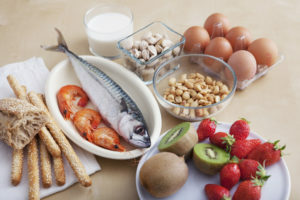 HomeConditions & Symptoms FAQWhat are Food Allergies? Food allergies occur when the body’s immune system makes a mistake and identifies a harmless food protein as a dangerous substance. Your body goes into defense mode, causing your immune system to generate an unusually large amount of IgE antibodies. They attack then release histamine and other chemicals in their attack against the false allergen. Food sensitivities are similar to food allergies, but there are some key differences. A gastroenterologist can perform tests to help you identify the foods that cause your allergic reaction.